Discussion in 'SF Open Government' started by Billy T, Jun 3, 2012. GWB’s tax reductions, especially for people like Warren Buffett with incomes greater than $250,000 did “trickle down” to create jobs in China. ... These modern Chinese factories with less than half the US labor cost will keep closing non-competitive US factories for many years (until long after GWB is dead). The US factories that the GWB’s trickle down did not close are staying open only by outsourcing many jobs. The US economy cannot recover while these more modern factories with cheaper labor exist. Note every bad thing I forecasts these US built, modern Chinese factories, would cause for the US has come true; however the FED, used its printing press money to buy Treasury bonds (FED is now the largest holder of Treasury bonds in the world.) so has managed to hold interest rates down longer than I expected. Every time (still) that I go to my page, I am annoyed to see this falsely given infraction listed. I want it removed. * TARP. QE1, etc. terms had not yet been invented so I said "Keynesian government deficits." I'm a nobody. So don't get me wrong when I post on this. Now that we've cleared up my importance to cyber-society; I think the improper language wasn't that you used vulgar words, but vulgar ideas. Bombing foreign factories in not just absurd, it's appalling. That it would even be proposed as a question shows very questionable judgment on your part. I would speculate that the reason you received the infraction point, from 2008, now expired, was kind of a "wake up" smack upside the head to make you stop, shake your head and clear it, and think about what you just said. The rest of the post deals with finances and economics- I gather that's your forte and you're good at it, but the question of essentially killing innocent factory workers should never have been raised. You would have been better off asking it be reversed if you showed that you understood what it was that you had done that elicited the reaction. Especially as almost 4 years have passed and you still don't realize how bad that sounds?! Granted, for some of the stuff I've seen posted around here... that doesn't justify any one of us doing it. "Our jobs are going overseas and it's bad for the economy!" "We need to do something about this!" "Yes, we need to do something." "Wait... WHAT?! Have you lost your mind?" If you keep posting like that, you might have to upgrade to a full size avatar. ... but the question of essentially killing innocent factory workers should never have been raised. Nor was it. In the thread it is made clear that even with the extra risk to US forces, weeks before hostile action is taken leaflets warning of the bombing are dropped - perhaps not telling the specific day and hour, but that warning alone would reduce the production of better and lower cost goods. ..."Our jobs are going overseas and it's bad for the economy!" "A capitalist is a man who will sell you the rope with which to hang him." - My translation from the original German. (I don´t know why this quote is so little known – perhaps the powers that be in the US think it might limit their economic freedoms?) US did sell to Japan almost all of the scrap steel it had in the years immediately before WWII. A little scrap steel is needed in a blast furnace as it melts and greatly facilities heat transfer to the Fe2O3 ore being reduced by coke as the process starts. The Japanese "kindly" returned that steel at Pearl Harbor! Karl Marx understood well the nature of capitalists. Can you say: "Out source the job?" - They can. Instead of a "rope" it is more modern factories with cheaper labor that will (and already are starting to) destroy the US. - When in the coming "worst-ever", "longest-lasting" depression grips the world (all but China and its suppliers of imports, who will effectively become economic colonies of China) then you may think this self-defense action should have been undertaken when it was possible. All of the many pre-emptive, non-judicial killings various presidents have ordered totaled were not as strongly needed self-defense as protecting US from mass riots, wide spread deaths, etc. that the chaos of the worst ever depression will bring. What is happening now in Greece (diabetics not getting insulin, critical heart medicine non-existent, etc.) will be mild in comparison as Greece is a small economy and the EU + IMF + ECB will not let massive disaster happen to Greece; however, when US goes to hell, there is no one big enough to help. SUMMARY: You seem to agree with James that some ideas should not even be discussed. I don´t like thought control by authorities. - It should be possible to discuss anything. Why my old post was made as a poll. *For example about a year ago, US navy intelligence concluded that even the non-nuclear semi-ICBM the Chinese had been testing, could sink a zig-zagging US carrier 1800 miles from China. (“Semi” as in the terminal phase it is not ballistic but homing on the target, (both by radar & optically) at several times the speed of sound.) China does not want a hot war as they are rapidly winning the decade old economic war. Many things can be reasonably discussed. However, reasonably is the key word. This forum, as already covered, is still far more lenient than most. Try saying that one over at BAUT and count the seconds 'til the perma-ban hits. Fact is, this is not a democracy supported by the U.S. Constitution. It's a dictatorship and a private arena. I agree more toward discussion than not and who stopped the discussion? You pointed out that the thread covered various issues. It seems you did get to discuss it and you did not get banned. You got one infraction point. No one censored you. You just got whacked for tawkin foolishness. Kinda foolish considering I've lodged a complaint on the management, too, huh? The avatar you see currently is my "posting" avatar. It's Cloud from FFVII. Which avatar I'm using can be an indicator of what kind of response you may get out of me. 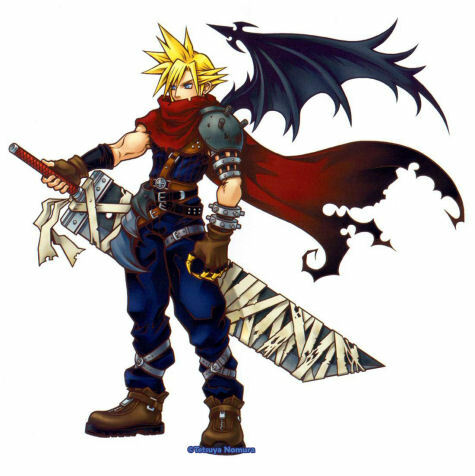 This is cloud from FFVII: Dirge of Cerberus, an evil, alternate reality Cloud, with the One Winged 'angel' (In this case, as evil alternate it's bat-like) wing- Sephiroth would manifest had the Single angelic feathered wing. And here's a fun tip: If you see a little extra space at the bottom of a post I make, you might try highlighting that space. Sometimes I hide things there. Usually, they aren't worth seeing anyway, so I suggest not bothering with this one. Cool idea, maybe I should find an attack clown? I'm not a big fan of bombing Chinese factories, but I really don't see talking about it as a problem, even on this science forum. For every topic it's always your choice to participate or not. I do draw the line at promoting illegal activities of any kind. But bad taste is fine. Even your white print which shows up clearly in the quote posting window. The Chinese have a very unique type of capitalism that's giving them a big advantage over us in many areas of the world. But our politicians and policy makers would rather complain and chastise the Chinese rather than learn and adapt our own policies. ... You just got whacked for talkin foolishness. Please re-state that it was foolishness in about 5 years (perhaps less) when US & EU are deep in the the chaos of the world´s worst ever depression. Even your white print which shows up clearly in the quote posting window. I've noticed that most posters have the courtesy to remove it when quoting. Please do not alter my words when quoting what I posted. Ever altering words to change meaning or intent of a post counts as intellectual dishonesty. You can use (sic) if you believe something is misspelled and requires attention. In this case, the spelling was deliberate. I agree that it is a problem. I don't disagree with you taking a whack for being way out in left field. You can have the decency to actually think... THINK HARD... about whether such drastic actions are necessary when there are plenty of more effective and peaceful methods to keep our economy at home. ... THINK HARD about whether such drastic actions are necessary when there are plenty of more effective and peaceful methods to keep our economy at home. I am open to any ideas you may have as to how to compete with more modern production facilites that have half (or less) the labor cost. Don´t tell me "automate" as (1) that reduces further the number of jobs. AND (2) both Japan and China are leading the way - US would be playing catch up, even to Germany. * For example, Foxcomm, world´s largest maker of consumer electrons, is now installing 100,000 production line robots as Chinese labor cost are rising at least 15% annually. When dealing with a minor power, boycotts, freezing leader´s bank accounts, etc. does work, but China´s retaliation for anything like this would hurt the US much more than US could "peacefully pressure" China. Hell for fear of what China can do to the US with little cost to itself, we dare not even officially declare the truth that they are manipulating the value of the RMB. * "... Record sales figures are expected in the German robotics and automation sector. "We expect to reach for 2011 a new sales record of EUR 10.3 billion" stated Thilo Brodtmann, CEO of the German Engineering Federation Automation + Robotics (VDMA Robotics + Automation). Robotics and automation sector turnover in Germany will record an increase of 37 percent on 2011 figures. OR at least skim this: http://www.caranddriver.com/features/vws-transparent-factory - Hardly a human hand touches the car as it moves along the intelligent floor. I am open to any ideas you may have as to how to compete with more modern production facilites that have half (or less) the labor cost. Don´t tell me "automate" as (1) that reduces further the number of jobs. AND (2) both Japan and China are leading the way - US would be playing catch up, even to Germany. For example, Foxcomm, world´s largest maker of consumer electrons, is now installing 100,000 production line robots as Chinese labor cost are rising at least 15% annually. This is best saved for a thread, one which does not Advocate War, and this thread left for Moderator viewing and contemplation. Or maybe right field due to the extreme rightwingedness of the notion. Billy, I like ya a lot man, but this world isn't free and that includes the USA. War talk as an option ought to be banned by all civilized people, even if all we westerners must die because humanity has direly screwed things so bad so as to cause widespread suffering in the world, in this case it might be in the West. That's ridiculous. Yes, let's let our enemies walk all over us because of all the bad things we've done! Let the war. This is not so important. What happened to the red shift ? No more red shift !?! Sorry, but you got it wrong in so many ways all I can do is simply object. War talk as an option ought to be banned by all civilized people, even if all we westerners must die because humanity has direly screwed things so bad so as to cause widespread suffering in the world, in this case it might be in the West. Where have I got you wrong, exactly? I thought about your us vs them philosophy and edited my post that you responded to. Let it go, man, for your own sake, and mine. ".... You just got whacked for tawkin foolishness. ..."
It was lost on me. - perhaps you will explain the point. I am slightly dyslexic, so usually (except for short replies) copy the post I am replying to into word and make my reply there. Word´s spell checker fixed you miss spelling while it corrected mine. I guess my word program is guilty of "intellectual dishonesty." Or you are just being silly? If that would prevent wars, I would agree, but of course limiting discussion would just make going to war easier for the leaders. Unfortunately, my discussion, did not prevent the US leaders from doing what they wanted to. * Perhaps if more had been as active as I was in trying to get the wisdom of the Iraq invasion discussed, it might not have happen. The US public was manipulated into a war frenzy – even an obviously staged and government supported, demonstration of “outraged US citizens” pouring many bottles of French wine into NY city street gutters was so well arranged that I watched it on CNN even in Brazil! (But the true nature and purpose of the demonstration was obvious to me. – Even angry Americans don´t pour more than $1000 into the gutter.) More rational public discussion was badly needed. * Even fabricating a letter supposedly from the Nigerian nuclear agency responding to Saddam´s request for Uranium. - They used an older copy of the agency´s stationary, which the CIA had, but the name had changed nearly a year before the date they placed on the fabricated letter - So this fraud fell apart soon after the invasion was under way. When no WMDs were found a series of other justifications were invented, but the real basis (desires for Iraq´s oil contracts) for the war was never admitted. SUMMARY: I STRONGLY THINK MORE, NOT LESS, DISCUSSION OF PENDING (or possible) WARS SHOULD TAKE PLACE. All political options, war being one most nations have used, should be discussed. In last decade or so, US has also "OKed" pre-emptive first strikes, non-judicial killing, on orders by several US presidents. They should be more discussed too. Only when an America citizen was the victim of a non-judicial killing was there any significant discussion. My controversial poll was about making a pre-emptive strike in self defense of the US economy. We did not do it, and now no longer can with acceptable US losses. Some may not agree with me that China is systematically taking many small steps to destroy the US economy so do not buy my POV that it would be justifiable "self defense" - that "speculation basis" is always a problem with pre-emptive strikes trying to prevent future injury from happening. I think many more will understand my POV when even the bread lines and soup kitchens in the US lack food. BTW this new threads title is not correct and is distorting. The poll I started four years ago made it very clear, that ONLY the more modern factories that GWB´s "trickle down" had built should be targets to "undo the damage GWB´s trickle down funding had made." I used Warren Buffett as an example. He now owns 10% of China´s BYD (Build Your Dream) motor´s modern automobile factory expansion. Billy, I don't accept initiation of any even non-violent type of competition against other people as ethical so it would take some extremely serious intention of doing malice against a country for war to be justified. And I agree that self-defense is the only possible justification. The Iraq war I agree with you on, but I'd say China isn't acting out of malice intending to hurt the USA, but rather trying to increase its prosperity and the injury is a consequence. Starting a war - and talk about starting a war is the type of talk I really mean by "war talk" - would be an egregious case of competition against each other. Competition against each other involves the intention to take something away from another. It is the attitude that determines whether it is against or not. There are cases where we compete with each other against bad things like disease, and that involves a different way of thinking of other people than competing against. There the competition is against disease not a person or people.